"Lexie D'La Perla, an American Bulldog owned and bred by D'la Perla Kennel, Miami, FL— Lexie is shown here in Brazil where she is receiving weight-pulling training." 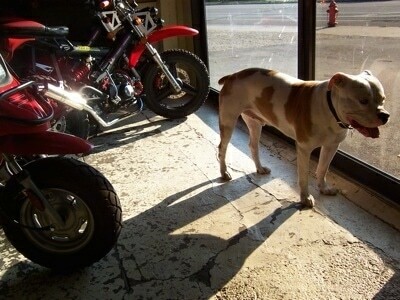 "This is the boss at Moto-Scoot in Milwaukee, Wisconsin. His name is Riley. His job—shop dog. We are a scooter shop, and he greets dozens of folks every day. Riley has friends that bring him treats, or just drop in to say hi. He is really famous around Milwaukee. You would not believe how many people remember his name months later when they visit again—usually to see him." 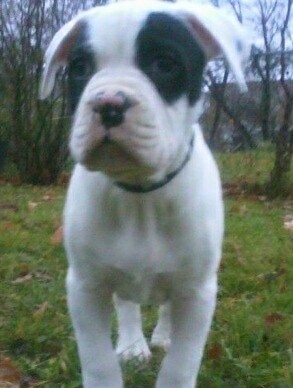 "This is Spot, my 4-month-old American Bulldog. 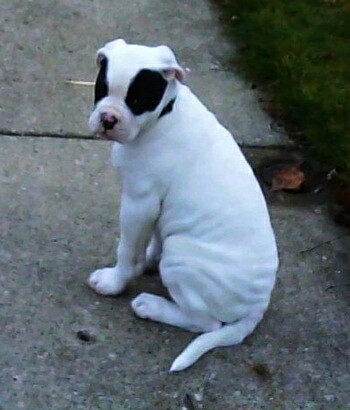 He is all white with 2 black spots over his eyes and a few on his nose and the tips of his ears. He is full of life, very intelligent (and spoiled) and will soon be starting K9 Bodyguard training." 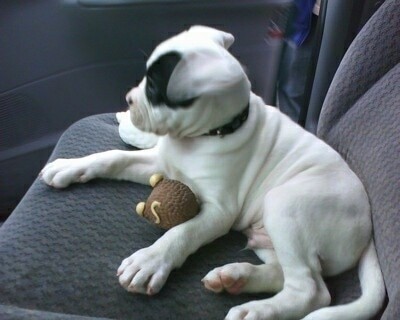 "Tanner is my 4-year-old American Bulldog. He weighs between 130 and 135 lbs. and has the best temperament of any dog that I know of. I grew up raising Rottweilers, Pomeranians, Australian Blue Heelers, Jack Russell Terriers and a range of mix breeds that my mother took in when owners would drop them off on their gravel road. He has been the kind of pet that you see in the movies when you are growing up, the one that is loyal, playful, loving and will not leave your side. Even as we speak and it is 2 a.m. he would rather sit next to me than go to sleep on the bed." 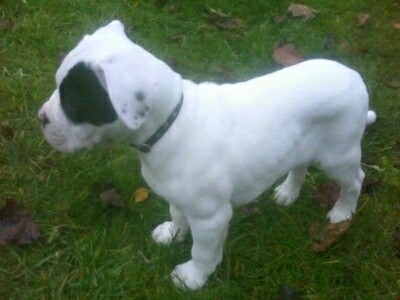 "He is a great watch dog for his bark but would try to lick you to death before biting you. His worst habits are trying to take up the entire couch and it doesn't matter if there are two people already on the couch before he gets on it. No matter what he always awaits permission and grunts when he wishes to climb on. He also has a habit of stretching out on the king sized bed in the middle of the night and pushing you out of his way with his feet. I am a 240-lb. grown man and he pushes me with ease. On the flip side, you will sometimes find him curled into a huge ball pressed up as close as possible to you in the morning." "He does have his flaws, though. Tanner is prone to allergic reactions from his environment and because of this hives have been a common occurrence. We combat this with everything being washed and dried in hypoallergenic soaps and fabric softeners. He eats 4 cups of "Fish and Sweet Potato" dry dog food from The Blue Buffalo Company. Their food contains no soy, corn, wheat, and is gluten free which keeps him from having allergic reactions. Unfortunately it is expensive compared to other brands but you save in the long run from vet bills and the dog’s overall happiness." "This is Emma. 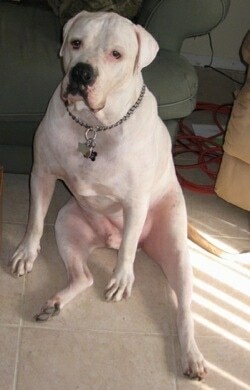 She is an American Bulldog that weighs in at about 87 pounds. She loves to cuddle, children, play fetch, and her favorite thing is to sleep. She is the nicest and most loving dog I have ever had. She is really good with other dogs and always wants to play. Though I don't think she is that big of a dog others say she is of a pretty good size. She is also very strong, to find out how strong she was I start hooking her up to a harness and having her pull different stuff from around the house and yard. At one point I decided to hook her up to the car and put it in neutral and to my surprise she pulled it halfway down our driveway, which is about sixty feet. But once again she is by far the best dog for a family or just anyone. Though it did take me a little longer to train her than any other dogs, which is strange because she is very smart and has a great memory." Leia the American Bulldog playing with the kids—her owner says, I've had her since she was 6 weeks old and she is now 8 months old. She is the funniest dog that I have ever been around. She just does some of the stupidest stuff, like chasing the lawnmower around getting a mouth full of grass every time she tries to bite it, and the funniest is when I'm cleaning my car, she tries to attack the water coming out of the hose. She cracks me up.